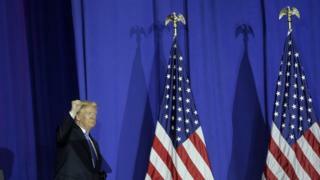 Image caption US President Donald Trump says the US tax plan is a "relic"
Taxes - the perennial bugbear of the Republican party - are back in the spotlight in Washington. Republicans this week outlined a plan to dramatically lower taxes on businesses and overhaul the code for individuals and families. Changing the way Americans are taxed was a key campaign issue of US President Donald Trump. Republicans say their plan will create a simpler, fairer code, with business rates in line with other countries. "Our country and our economy cannot take off like they should unless we dramatically reform America's outdated, complex, and extremely burdensome tax code," Trump said this week. "It's a relic. We've got to change it. We have to compete with other countries." So is the US system actually an uncompetitive relic? And if so, will the Republican plan fix it? Are US taxes more complicated than in other places? Complaining about the complexity of the tax code is hardly limited to the US. After all, the UK has an entire government office dedicated to "tax simplification". But the US is worse by some measures. A typical US company will spend about 175 hours to comply with the tax code, according to a report by accounting giant PwC. Reality Check: Is Trump right that US has highest taxes? That's higher than in the UK (110 hours) and across Europe (164 hours ). In recent years about 90% of US tax payers sought assistance from software or professionals to file their returns. But proposals for the government to prepare returns for households based on the information it already collects have met fierce opposition, especially from tax filing firms. Such a system is already present in countries such as Sweden. But it's not clear at this point whether the Republican proposal will end up creating a simpler code, said Kyle Pomerleau, director of federal projects at the Tax Foundation, a Washington think tank focused on tax policy. The framework released this week explicitly preserves several popular tax benefits for families, including those related to home ownership and retirement. On the business side, the framework has also caused alarm, since it focuses on lower rates and doesn't specify what benefits would be erased. Is the US corporate tax rate so much higher? The US federal tax rate for corporations is 35% - the highest in the OECD. But very few businesses in the US actually pay the top rate, thanks in part to a bevy of loopholes. The effective tax rate for big corporations is actually about 22%, according to the US Treasury Department. The Republican plan would lower the official rate to 20%. That would be lower than in Australia (30%) and similar to the United Kingdom (about 19%), as well as many other countries in Europe. Given the high current corporate rate, many companies in the US also opt to organise as "pass-through" entities, which get their name because the profits are "passed through" to the owners and charged at the individual rate. Those firms would face taxes of 25% under the Republican proposal. Does the US system encourage companies to move overseas? Under the current system, multi-national companies based in the US face taxes on all their profits, including what they earn overseas. That is relatively unusual, says Mr Pomerleau. Broadly speaking, many other countries in the OECD, including the UK, have already turned to a so-called "territorial system" in which taxes apply to profits based on where they are earned. The UK has also imposed rules to crack down on companies that opt to headquarter in tax havens. That's key to stopping companies from hoarding profits offshore, Pomerleau says. The Republicans say they plan to craft a similar measure but it's not clear what it will be. How do tax rates for families compare? Republicans are proposing to collect taxes at three rates - 12%, 25% and 35%, with a possible fourth, higher rate. Direct comparisons to other countries are difficult because the framework does yet not say what incomes would qualify for each rate. But we can draw some clues from the current system. At the low end of the scale, the Republican plan is roughly comparable. It would make the first $12,000 tax free for an individual, roughly double the current amount. That is similar to the UK, which does not tax income up to £11,500 ($15,500) and Australia, where the central government exempts up to A$18,200 (US$14,200). But rich American families face far lower rates and are more likely to take advantage of deductions Republicans want to keep. In 2016, the top rate was 39.5%, but that applied only to income above $415,000 (£308,000) for an individual. In the UK, individuals face a 45% tax rate on income above £150,000 ($202,000). In Australia, a 45% rate applies to income over $180,000 (USD $141,00; £105,000).